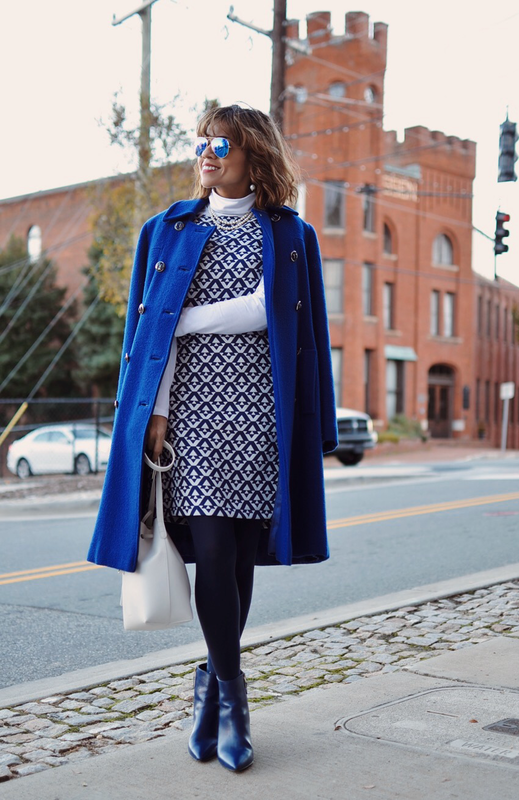 This week's "Monday Work Outfit" is all about richly saturated shades of blue. This is the perfect look for women that want to stand out at work in an exquisite way. 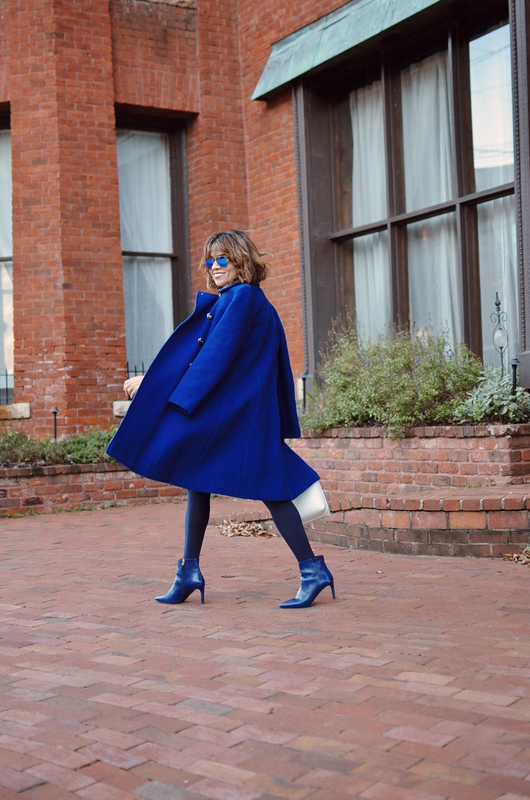 Unlike red sometimes does, an intense hued blue makes a statement without being too cocky. 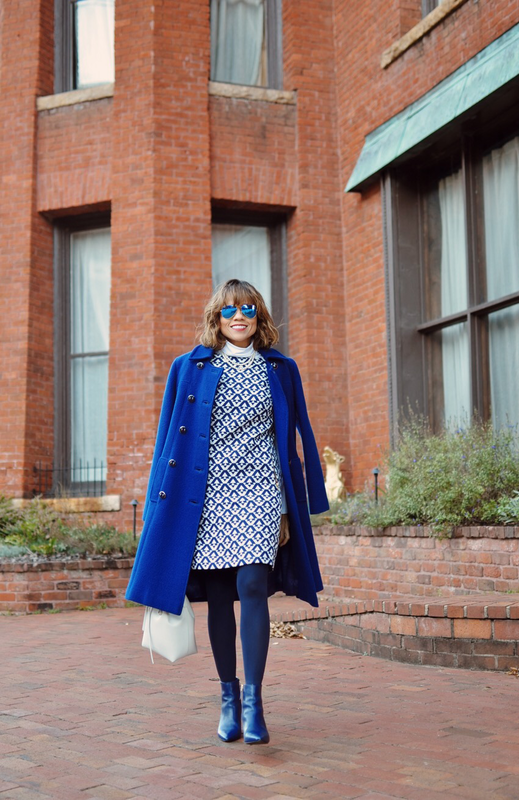 So, how can you wear a bold shade of blue such as cobalt for the office? 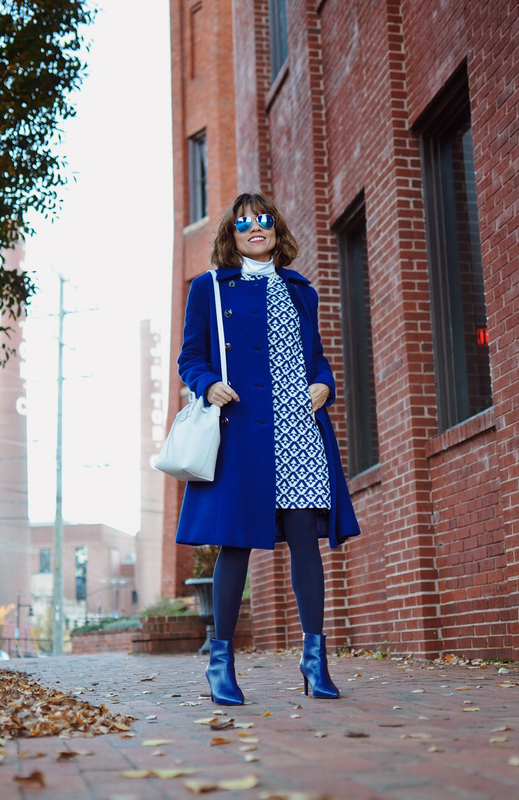 Well, style it as you please, however, I personally like the idea of pairing cobalt blue with other cool hues that will make harmony with its icy cold flare. Bright blue colors pop against other cool colors (especially white) beautifully, creating a rich and yet sophisticated bold statement. 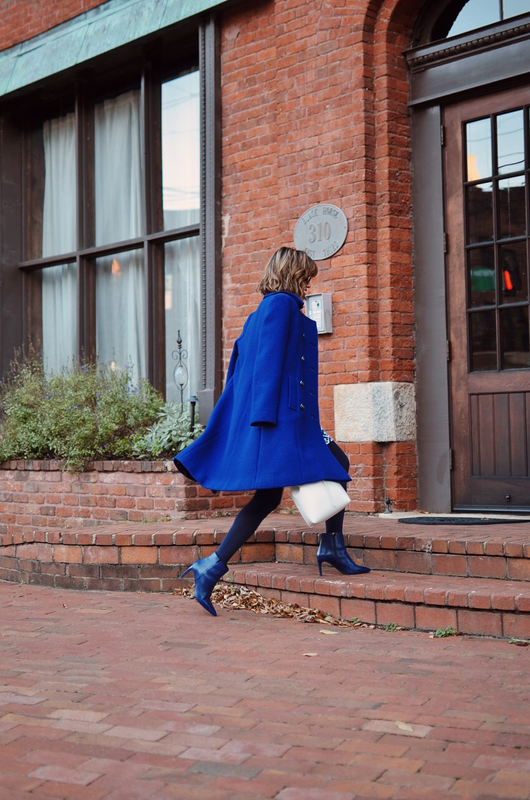 Very chilly days are approaching us, therefore, having a statement coat (regardless of the color) that does the talking when you are outside is very important. 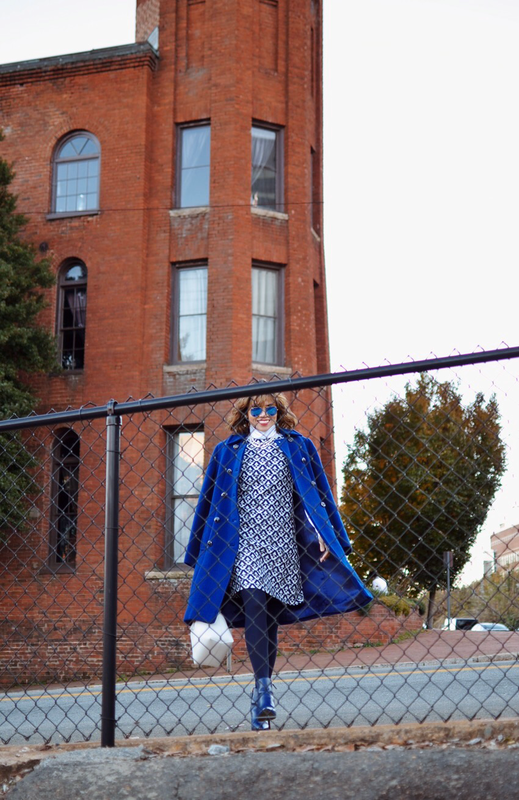 And with that in mind, I not only wore a fun piece to stand out indoors such as my printed shift dress, I also wore this military-inspired coat that wouldn't allow me to stand shy when commuting from home to work or vice-versa. After all, your coat is what people see the most in the coldest months of the year. In my humble opinion, wearing this printed dress was a clever way to bond the blue-hued pieces with the white ones. I also like how its geometric print served as an interesting and yet coordinated focus point. And by the way, this outfit is also an example of how to style your warm-weather dresses for cold months. Accessorizing accordingly for this sophisticated outfit was critical, therefore, pearls as jewelry seemed to be the right choice. I don't know about you, but blue hues always give me a feeling of cleanness and structure. It's interesting how colors can bring to the surface certain feelings to us. In fact, I believe this is the main reason why I sometimes chose to wear tonal looks. Coat: Vintage. Very similar here and here/Dress: Tahari ASL/Bag: Mansur Gavriel/Sunglasses: Ray-Ban/Pearls Necklace: The Pearl Source. Similar/Earrings: Vintage: Similar/Boots: LK Bennett. Similar/Tights: Joe Fresh.